This romantic Collectif concoction felt perfect for a delicious roast over Easter with my family. I am loving the beautiful print on my fave dress shape ever - the Dolores Doll. And how pretty is this cardi? More bang on trend embroidery! 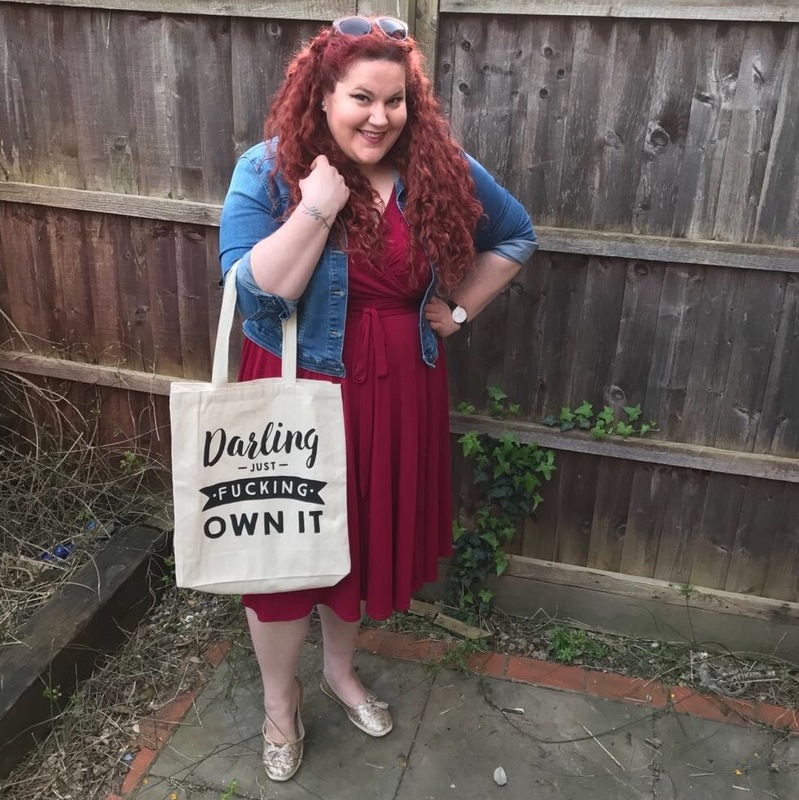 The Lady Voluptuous Lyra dress is still one of my fave pieces for everyday wear (I know, I'm fancy) and here I popped it on with a denim jacket and a no nonsense tote I got for my birthday (how well do my friends know me??) for a little trip to the garden centre. My garden is my new obsession! I totally adore this lace dress from River Island Plus, and yet I totally haven't worn it enough! So I gave it a little outing for an early birthday dinner with my family. 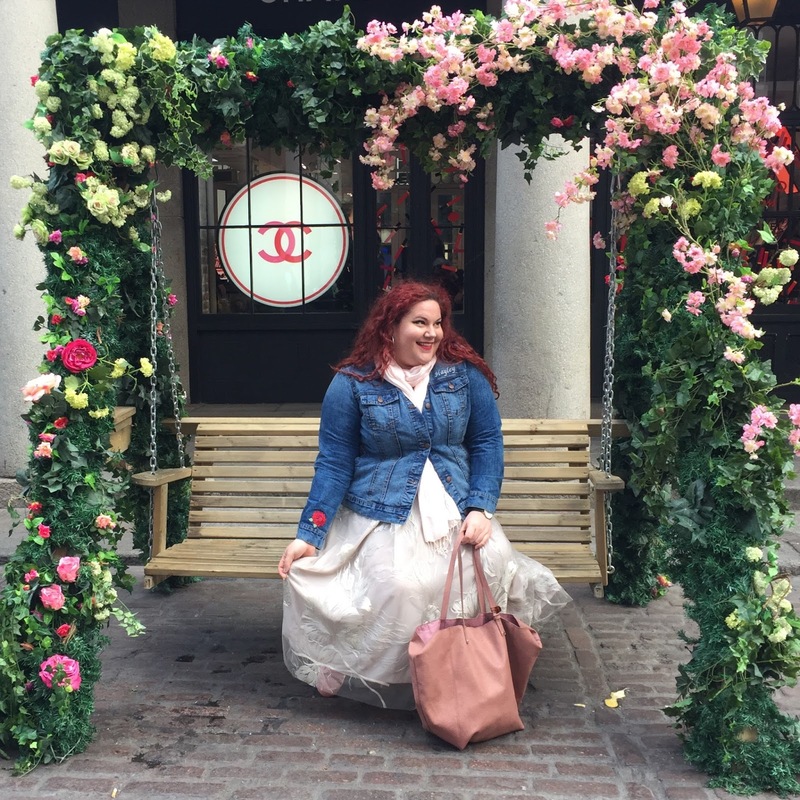 It was a little chilly so I popped on some black tights and ankle boots, added a denim jacket and a wonderfully sparkly sequined purse from Skinny Dip London. I am still working on my casual look, but I am loving short oversized t-shirt dresses with trainers. This is what I wore to a wonderful little tea and cake meeting with the team from Curve Fashion Festival. I went last year, and it was a great event. I will definitely be there this year! It's in September in Liverpool - have you got your tickets yet? I am such a sucker for a maxi dress, and I just love this beauty with it's unusual colouring and bold graphic print. I wore this for tea and shopping with my mum, on my actual birthday, and it was cool and comfortable. Read my full review here. One Sunday in early April we got an unexpected early blast of summer in London. I dug out my flip flops (come summer I live in my black Havaianas, like a uniform!) and these jersey trousers from Evans (cool and comfortable) and this cute crochet top, and spent the afternoon lying on the grass in Battersea Park (which is pretty much a stone's throw from my house) people watching. I love a lace dress for summer. I also love to grunge it up a little bit, so adding my Dr Martens while it's still a little cooler is perfect. 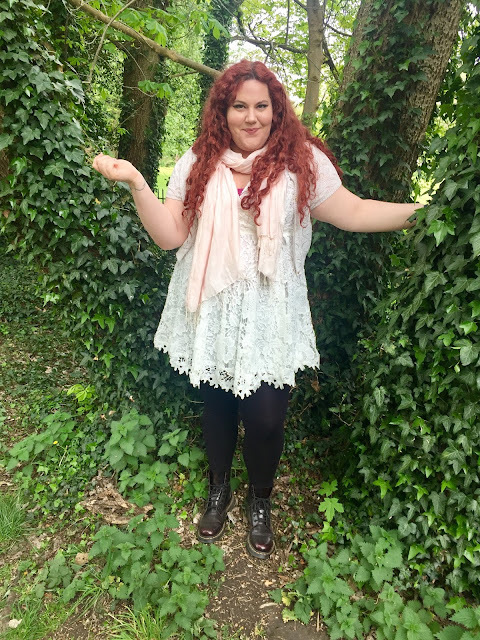 This dress is my first piece from Quiz Clothing's new plus size range. Read my full review here. I spent a wonderful evening at God's Own Junkyard in Walthamstow. It's an exhibition space absolutely filled to bursting with the most incredible neon signs. It made my shiny, sparkly, vegas loving heart too happy, and if you ever have a chance to visit you totally should. It's incredible! You have such an enviable dress wardrobe! And that rose arch pictures is the most delightful thing ever!